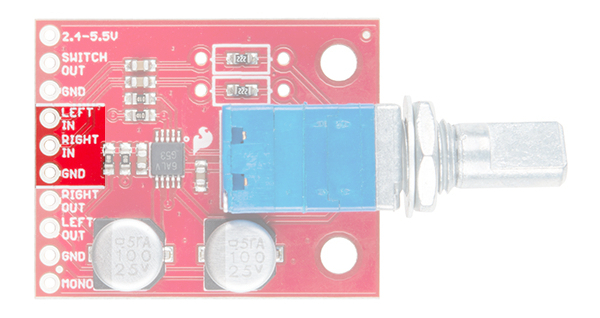 The Noisy Cricket Stereo Amplifier, uses the LM4853 which can be configured to output up to 1.5W of power in mono operation (4Ω load) or 300mW per channel in stereo operation (8Ω load). The amplifier comes with a dual-ganged pot with a built in switch to control power and adjust both left and right channel gain. 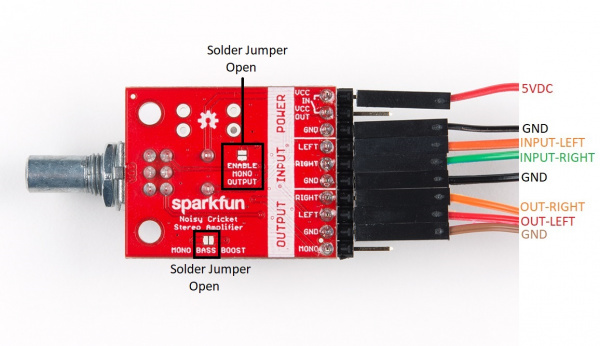 In this tutorial, we'll show how to wire it up and crank up your tunes! 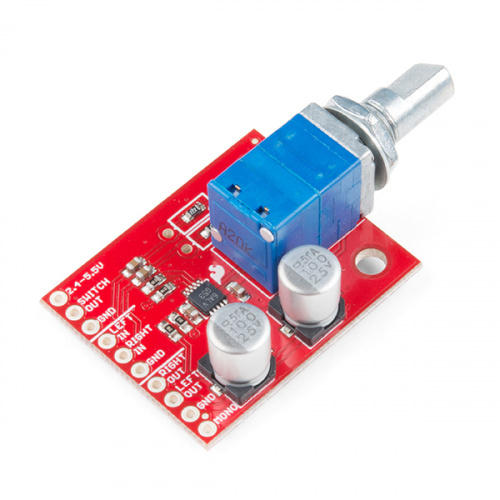 A small audio speaker that is ideal for radio and amplifier projects and is small enough to fit in robot projects. The power section has three connections: VCC, VCC OUT, and GND. 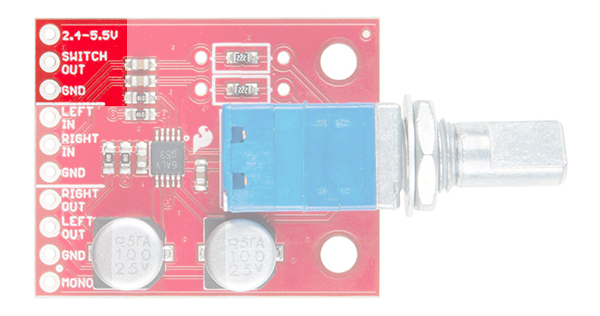 VCC and VCC OUT both require a voltage range of 2.4-5.5VDC, but only one connection is required. The pot to control the volume has a built in switch. VCC is on the "input" side of the switch, meaning that the amplifier is off when the pot is turned all the way counter clockwise and turns on when you hear the switch click when turned clockwise. VCC OUT is on the "output" side of the switch, meaning that when power is applied to this pin, the amplifier is on regardless of the switch. 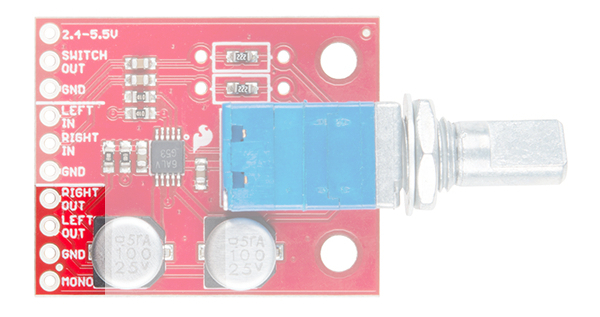 The switch is rated for 3A of current, which means that you can connect a 5V audio source to VCC OUT and have both board power on at the same time without having to connect multiple switch to power up all of your electronics. Out of the box, the resistors are configured to take a headphone output signal from your computer or phone. When cranked to 11, the output will be distorted, but that was done deliberately to make sure you're able to get the full power from the amplifier. In stereo operation, both channels are effectively inverting amplifiers, which allows us to use the following formula to calculate the gain: Av = -Rf / Ri, or Av = - Rpot / 2.2kΩ. In mono operation, one amplifier is 180° out of phase, so the gain becomes Avd = Vout / (Vinl + Vinr) = 2 * (Rf/Ri), or Avd = Rpot / 2.2kΩ. The output of the Noisy Cricket can be configured as stereo or mono. In stereo operation, the output has a maximum power output of 300mW/channel (with an 8Ω load). To connect your stereo speakers you'll need to connect each speaker to the left and right output pins, as well as ground as shown below. To get the full output power from the amplifier you'll need to configure the Noisy Cricket as a mono amplifier. When configured as a mono amplifier, the left and right input channels are combined to drive a single speaker. To enable mono operation, use solder to short the two pads labeled "ENABLE MONO OUTPUT" on the back of the board. It's also recommended to close the other solder jumper labeled "MONO BASS BOOST". Each output has a 100μF decoupling capacitor that is used for stereo amplification. In mono mode however, the output doesn't need to capacitor and will filter out some of the lower bass frequencies and as a result, the audio will sound more "tinny". The mono bass boost jumper shorts the left output decoupling capacitor which will allow the lower frequencies to pass. In mono operation, the output has a maximum power output of 1.5W (with a 4Ω load). To connect your speaker you'll need to connect one pin of the speaker to the left output pin, and the other to the mono output pin (but NOT GROUND!) as shown below. As mentioned in the previous section, the Noisy Cricket has an output power of up to 300mW/channel in stereo operation, and 1.5W in mono. The power output depends on not just the output load, but the power supply as well. Borrowing a few graphs from the datasheet should help us understand our power supply and speaker selection. In the first graph we see the effect that the load (speaker) has on the output power available. As we can see, there is an inverse relationship between the load resistance and the output power. To get the most out of the Noisy Cricket, it's recommended to use a 4Ω speaker in mono operation and an 8Ω in stereo. This next graph we're still looking at the output power versus the load resistance, but instead of the power being measured in watts, it's in milliwatts. So what gives? The variable that was changed was the supply voltage, VDD. In the first graph, VDD was equal to 5V, and the second VDD is set to 2.7V. With approximately half the voltage, the output power is around four times less with the same load. While the amplifier functions down to 2.4V, it will mean that you have less output power available if your load resistance remains constant (thanks to ohm's law). To see the full effect the supply voltage has based on a few of the more common loads refer to the graph below. With these graphs in mind and maximize the power output, we recommend a power supply voltage of 5V with a current rating of at least 100mA. For the stereo amplifier, use 8Ω speakers. For a mono amplifier, use a 4Ω speaker. 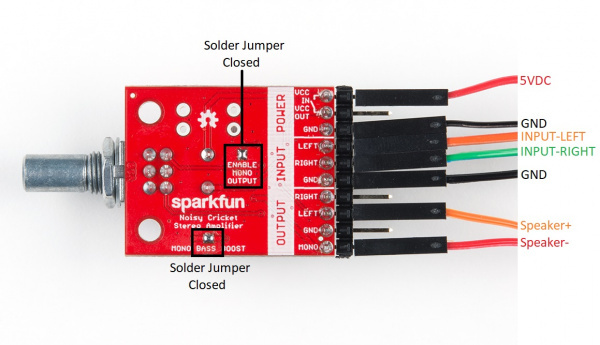 A hookup guide to get you started with the RN-52 Audio Bluetooth Module Breakout Board. 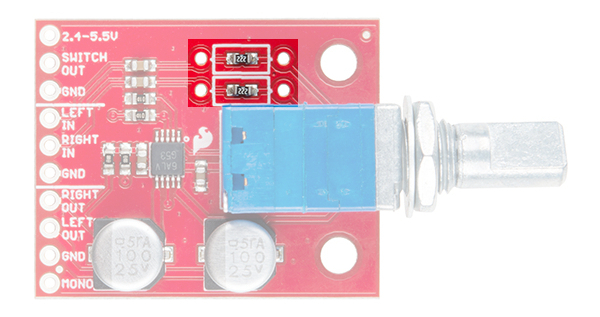 Add some tunes to your project with the Si4703 FM Radio Receiver Breakout. Add sound effects to your project, prop or costume with Papa Soundie Audio Player.